Our House Die Fabrik - baxpax Hotel - an old factory building from the turn of the century - was restored and developed in 1995. The typical Berlin-Kreuzberg charme of a brick building has been retained with light, spacious rooms and a courtyard garden. On each floor you can find large bathrooms. Breakfast, lunch and dinner are served at the Fabrik-Cafe. Die Fabrik - baxpax Hotel is located in the heart of Kreuzberg and surrounded by a lot of bars, small shops, restaurants and famous Berlin night clubs. The East Side Gallery and Görlitzer Park are also just around the corner. To maintain a private atmosphere we do not have TV or telephone in the rooms. International calls can be made at any time in the lobby. Our rooms are bright, spacious and very quiet. For your convenience you can book single and double accommodation or rooms for more than two people. You'll find a personal locker for your luggage. Check in from 15:30 to 23:00 . Taxes not included - 5.00% city tax. Bed linen in dorms once 2,50 €. Stayed there for 4 nights, the place is well connected via U-Bahn and S-Bahn. The staff is polite and helpful and is available 24/7. The Berlin East Side Gallery is at a walking distance, the area also has some good Clubs, Bars and Restaurants. Large hostel in old industrial building. Pretty cool in a way, but not very cozy. The accomodation was very good. We were there in lowseason so i cant jidge about the atmosphere, but it didnt have a nice chillroom or something, just a lobby. Bang for buck tho! 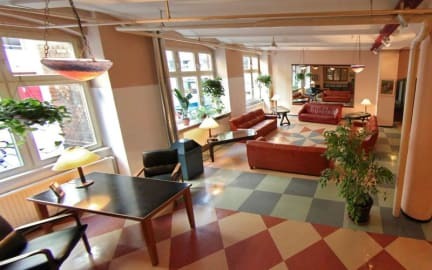 The hostel is located ideally in the heart of Kreuzberg. There were endless bars, restaurants and clubs all within walking distance. The room and linen was clean, as was the bathroom. You should know that the dividers between the showers are pretty transparent, but they're not mixed-gender so its not that bad if you don't mind - you get what you pay for! Definitely value for money, would recommend for those passing through to enjoy Berlin's legendary nightlife! The staff was really nice and helpful however we were staying at a 3rd floor with no elevator which made it a torture for my bags. The beds were really bad quality and the 3rd floor has a strong smell of humidity. It’s a very good location close to East Side Gallery. Staff: Kind and Helpful! Building: Old(no elevator) but beautiful. Beds: Comfortable, but 2.50 for sheets and you had to make your own bed. Lockers: Existed,but without a lock. You had to have your own, or buy. However, the receptionist offered to keep sth for us for a short time for free. Toilets: 2 stalls (1 was not working), 2 showers, 2 sinks for all the floor (10rooms). Clean-ish but when there is 1 toilet for many people, it gets dirty quickly. Great location, that's what we paid for! Staff were nice and helpful. Little common area to meet people and bad location. Showers were shared. 2 showers separated by a transparent wall. It was also timed, you had to keep pushing the valve so the water would run again. Total deal-breaker, I won't be staying there again. Bed is functional, rooms are functional, all in all it fulfilles a purpose. The location is amazing and for just sleeping the place is fine. Unfortunately, the shower doesn’t have a lock on it and the water runs only for 4 seconds at a time. Also, it’s quite scary to have a locker where you need to leave the key at the reception every time you leave. And to get the key back, you only need to tell them a number and they give you a key without checking if that’s your room. I haven't been informed that our room was on the fourth floor and that the elevator could not be used for anyone but the staff. Also, low security - anyone could walk in and ask for my key without any identification. Some staff were rede and helpless, they don’t care much for the guests. Bathrooms need improvement, no kitchen to cook, their leave you locker key in the reception makes no sense,and there was some weirdos staying in there.